It’s been 6 six years since I did this stencil. 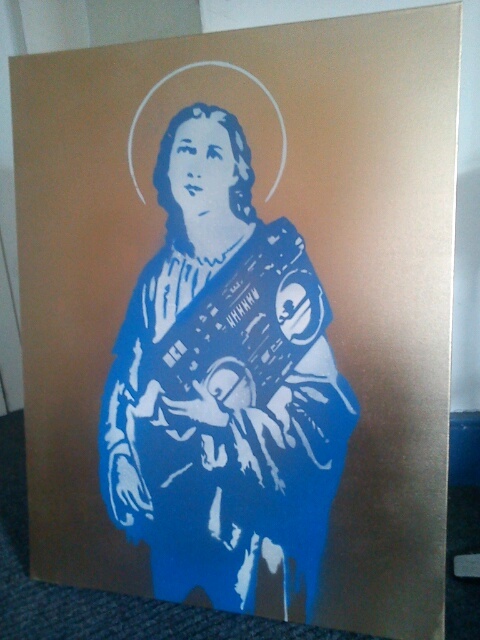 Madonna in the Ghetto came from my first show ‘Artivism’ in 2006. I created five in blue but wanted this one to be special. I was asked to sumbit a piece of work for an exhibtion to raise funds for Kasey Kelly and 1 year old whose was diagnosed with a rare malignant brain tumour known as Atypical Teratoid/Rhaboid or ATRT. This type of tumour is very aggressive and extremely rare worldwide. An exhibition featuring this stencil and other works will be held Holy Thursday at The Front Lounge, Parliament street, Dublin to raise fund for Kasey’s life saving operation.